For better or worse, an increasing number of smartphone manufacturers have embraced the notch. Making its debut on the Essential Phone before exploding into the mainstream with the iPhone X, it allows phones to have a 'bezel-free' display without compromising the camera, sensors or other front-facing components. Some people consider notched displays to be a necessary evil. Others think they're an abomination. Whichever viewpoint you prescribe to, it turns out you can have an edge-to-edge screen without relying on a notch - all you need is a pop-up camera. Genius. Earlier in the week, Oppo unveiled the unusually named Find X smartphone to the world. Like most flagship Androids, it has some beefy specs beneath the hood including a Snapdragon 845 processor, 8GB of RAM, 256GB of storage and a 3730mAh battery. It also comes with a 3D facial scanner that supports mobile payments through Alibaba's Alipay, dual-SIM posts, a Smart Selfie Capture mode and VOOC fast charging. Oppo just announced its brand new flagship phone in Paris — the Find X. It includes some interesting design choices, the most significant being its stealth camera that only pops up when you turn the phone on or open the camera app. Oh also, it has 3D facial modelling that you can use to shop online. The upshot of all this is that the Oppo Find X gets to have its cake and eat it too - there are no bezels wasting valuable screen real estate but there's also no notch eating into the display. The idea is so simple it's a wonder other manufacturers haven't done it already. We really, really like the look of that bezel-less display - and it's mostly down to the lack of a notch. Even if you don't mind notched displays (and the concept does have its fans), it can't be denied that they get in the way while viewing media in full screen/immersive mode. The pop-up mechanism deftly removes that problem. The only downside is that it necessitate a slightly thicker phone. Personally, we're willing to live with that if it means an edge-to-edge screen without any obstructions. Hopefully other manufacturers will trial slide-out solutions of their own. Oppo has not released pricing or availability info yet. but it has confirmed that the device will be shipping to Australia. If you'd like to know about the Find X, click here for our hands-on first impressions. When Essential debuted the first-ever notched display on the PH-1, it was a bold, divisive statement about smartphone design. Then Apple put one on the iPhone X and while some people still didn't get it, the sentiment around the notch shifted from confusion to curious appreciation. But now, after going to Mobile World Congress and seeing pretty much every other smartphone maker adopt the notch, the feature has almost entirely lost its cool. 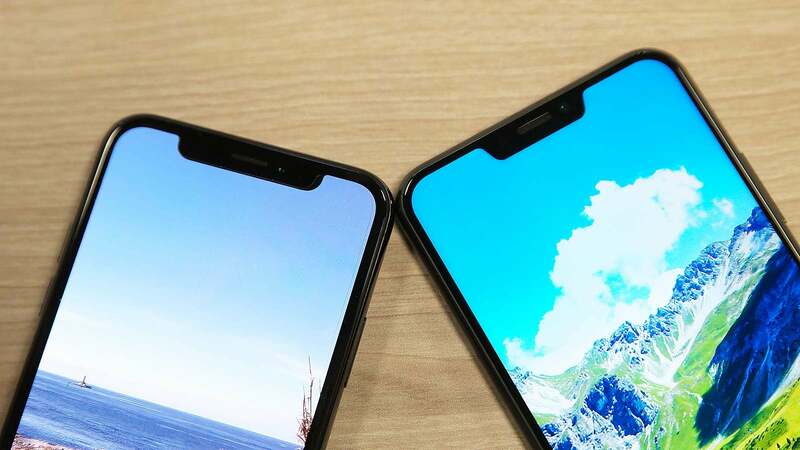 China seems to be upping the game for these types of phones, Chinese phone manufacturers have revealed a few bezel-less phones lately which no doubt will be implemented within the next couple of generations of Galaxies S's and iPhones. While it's great to get bezel-less screens, the option for mechanical or pop-up cameras is the inevitable wear-and-tear that comes with them over time. Phones are with you at all times - and people like to naturally fidget with things. The mechanical camera will have to endure hundreds of thousands of actuations, maybe even millions, with no maintainence or lubricants, without wearing out or breaking down. That's a fair ask, even with today's tech. I'm sure we've all had a phone, currently or in the past, that had a mechanical feature that got looser or more spongey over time. The iPhone home button was infamous for this, and the rotating camera and the flip-open action on the Motorola RAZR also wore over time. There's also the risk of getting dirt, debris and stuff in the working tracks of the parts that move. One of the key selling points of phones nowadays is waterproofing - is that still going to be the case with moveable cameras? I'm all for this feature - I just hope it isn't half-assed in implementation. I doubt that itll need millions, even if you used the camera 30 times a day every day its only 11,000 activations a year, its not like itll pop out once per photo. There are 2 extra benefits tot his design. But i agree it would have a issue with dust and water resistance, it also might be hard to make a case for it, unless the case has a built in sliding mechanism, or no/limited top protection, as well which would have its own issues. It pops out to read your face to unlock the phone. True i forgot about that, but that's because i doubt id ever use it, i much prefer fingerprint. Even so 365,000 activations would last you 5 years at 200 activations a day, assuming sleeping for 8 hours, thats 11 activations every hour (every 20seconds) for 18 hours a day for 5 years, so millions would be overkill, especially if you have a delayed lock (i have a 5 second delay between auto screen off and lock). Something actually innovative coming to phone design. All for it. Didn't Vivo do this first? I read the headline and thought that same thing. I miss the ability to hold my phone in my hand and not actually touch the screen. I miss using my phone one-handed, reaching my thumb over the right side to type an 'a' for example and my screen not getting confused because I also accidentally touched the right of the screen. I'd love for my toddler to be able to hold my phone and watch a video without accidentally pressing the screen and interrupting it. Where does it have its other sensors for detecting light levels etc? It won't work. This means I would have to slide the back up every time to view my face, so it can unlock the phone. It looks nice, but it is not functional. Looks awesome! I miss the days of fancy mechanical features like that on phones!